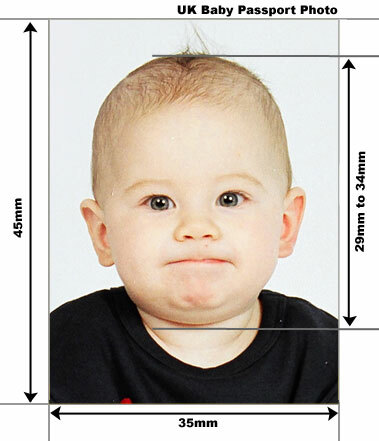 UK passport Photo Guidelines for Children under the age of 5. Because of the difficulties in photographing children under the age of 5 for UK passport photos the regulations are slightly more relaxed as per the guidelines below . For UK Baby Passport Photos under the age of 6 months, the baby does not have to have their eyes open. However there should be no supporting hands should be visible. Flash from the camera will always cause shadows as will artificial lighting. Our best advice is to photograph baby outdoors on a cloudy bright day - very common in the UK. Lay baby on a suitable light gray background and take a picture. If you intend to send the picture to us for printing out, we ask you to photograph baby leaving plenty of room above the head and take a half length picture. When you send this to us for printing we will resize the picture for the correct passport requirements. This technique can be modified to suit the baby passport requirements of any country in the world. We advise you not to take a chance with your passport or visa application. If the submitted photos are incorrect your application will be refused causing stressful delays and even unforeseen expense. We guarantee to get your photos right first time which means that your application will not be rejected on the grounds of an incorrect photos. You can pop into our professional passport studios 6 days a week and you don't even need an appointment. The results are ready usually within ten minutes.